Why Hillary Clinton is talking about Donald Trump and the alt right. Euro-style white nationalism has come to America and found an unlikely standard-bearer in Donald Trump. 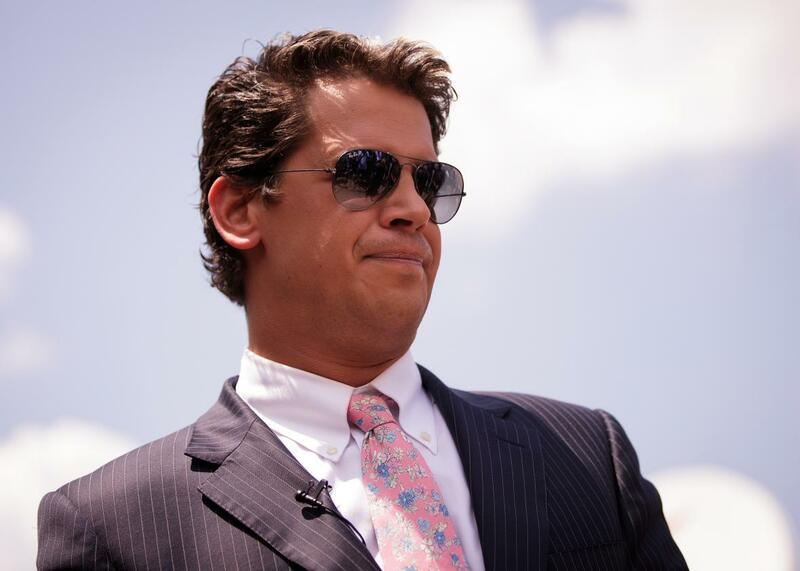 Breitbart technology editor Milo Yiannopoulos, pictured in Orlando, Florida, on June 15, is a prominent voice of the so-called alt right. Spencer, a clean-cut 38-year-old, loves publicity. He hung around last month’s Republican National Convention in Cleveland with a sign saying, “Wanna Talk to a ‘Racist’?” He is president and director of the National Policy Institute, described on its website as “dedicated to the heritage, identity, and future of people of European descent in the United States, and around the world.” He coined the term alternative right, founding the website alternativeright.com in 2010, which has since morphed into the highbrow racist RadixJournal.com. “The alt right has really become the banner for European identity politics in the United States and around the world,” he said. Spencer agrees with Clinton about very little, but he agrees with her about this: Understanding the alt right is important to understanding Trump’s rise. For the alt right, a movement nurtured on internet message boards and websites full of obscure in-group jargon, such a high-profile denunciation is a big deal. The white nationalist website VDARE is already fundraising off the speech. Yet it is Trump, not Clinton, who has given the alt right unprecedented political relevance. It’s not just that he’s a hero to the movement. He has actively helped expand its reach. He retweets white supremacist accounts and echoes alt-right rhetoric about America’s devolution into a violent mongrel hellscape, besieged by immigrants from without and crime and disorder from within. Trump shares the alt right’s respect for Vladimir Putin, admired by many in the alt right as the leader of what Spencer calls “a powerful white empire.” (By contrast, said Spencer, the countries of NATO are “cucked nations”—cuck being a favorite alt-right insult, invoking white men who are cuckolded by black men.) Trump’s comparisons of Clinton to Angela Merkel might have puzzled many Americans—Germany’s chancellor isn’t a household name here—but as ThinkProgress reported, white supremacists who revile Merkel for her policy on migrants have been making the same connection for months. Until recently, the overlap between Trump and the alt right seemed more a matter of what Spencer calls “elective affinities” than active coordination. But earlier this month, Trump hired Bannon, then chairman of Breitbart News, to be his campaign’s CEO. Bannon has run Breitbart since the death in 2012 of its eponymous founder, Andrew Breitbart, turning the site in an explicitly ethno-nationalist direction. “We’re the platform for the alt-right,” Bannon told the journalist Sarah Posner last month. Ironically, for a movement obsessed with nationalism, the alt right has more affinity with the European right than traditional American conservatives do. United by ethnicity rather than religion, it is less moralistic than the Christian right; like the right in Europe, it is more likely to condemn Muslim homophobia than to condemn homosexuals. The big alt-right event at the Republican National Convention was the Gays for Trump party hosted by Milo Yiannopoulos, Breitbart’s technology editor, which drew Spencer, Brimelow and Dutch right-wing politician Geert Wilders. The alt right sees allies in France’s National Front and Britain’s U.K. Independence Party, whose leader, Nigel Farage, rallied with Trump on Wednesday night in Mississippi. He’s right, it is. Now Clinton has to make it clear to America what that means.